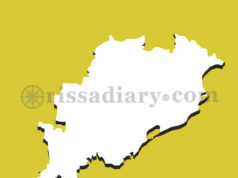 Report by Badal Taha, Rayagada: The second day stir at IMFA took a U turn while hundreds of members of three workers’ unions of IMFA, Therubali alongwith Zilla Adibasi Sangha, an apex level tribal organisations of the district took out a rally in front of IMFA office and marched to District Collector’s office at Rayagada. This was to counter the protesters led by Sri Jitu Jakasika, who, according to the marchers, was an outsider not belonging to the block. While marching the gave slogan against the district administration alleging having a bias towards the agitators. 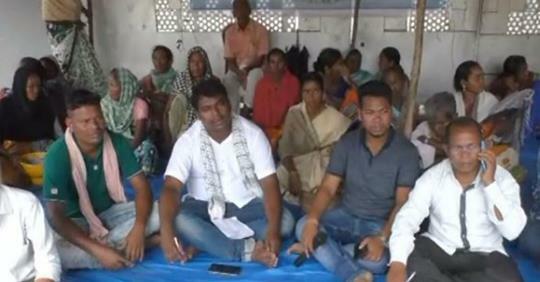 Members of IMFA Workers Union had an argument with Sri Prabir Nayak, Sub-Collector, Rayagada while the wanted to give a memorandum to the Collector en-masse. 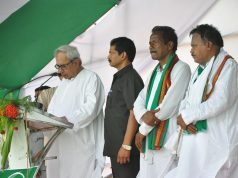 My Nayak emphasised that not all the workers but their representatives numbering four to five. “There are hardly thirty five to forty persons sitting in front of IMFA gate and forcibly obstructing the labourers to enter into IMFA campus. This has hampered the livelihood of poor labourers. If the administration do not take the protesters agitating illegally, then the workers will be forced to resort to blockade in front of the collector’s office”, warned the General Secretary of the Workers’ Union. To this, Sri Nayak, Sub-divisional Magistrate was infuriated and asked whether they have taken legal permission for loud speaker, etc. Sri Rabindra Patra, IIC, Rayagada also reiterated that legal procedures needed to be followed before resorting to any kind of protest. Mr Nayak then told the marchers to keep calm and cooperate for an amicable solution. Though the agitators, congregated under no banner, are protesting with a plea that not a single demand has been fulfilled by IMFA authorities within one month as agreed upon during the tripartite agreement earlier, IMFA’s management refute any such lime limit. According to officers of IMFA, most of the demands are either met or in the process of being fulfilled. The mobile ambulance will be operational in July. Local youths will be skilled under DDUGKY at JK Pur and ITI, Therubali to acquire employability. An inventory is being made regarding the numbers of workers going to retire and dovetail skilled youths in the gap. Sexual Harassment Committee and Internal Complaint Committee are in place. Facilities of workshed, toilets and drinking water are provided for the working women. The Chinmaya Vidyalaya authorities have been instructed to strictly adhere Right to Education Act. A drinking water project containing 3000 litres of overhead tank will be completed at the fag end of July. 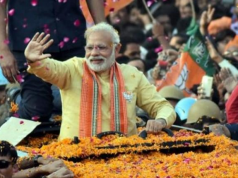 Five to six villages will be electrified through solar power. The contractors have been instructed to follow the Minimum Wages Act. All these have been given in writing to the Collector. Nevertheless the protesters are questioning about the pollution, illegal land acquisition, meager wage to workers, etc. The Collector has taken the issue seriously that the workers were not paid 18 days wage during the stir and lock out held during month of May.